Guided by the Health Policy Committee, AHHKS provides physicians and their patients comprehensive and timely analysis of health policy issues pertaining to hip and knee surgery. Each year, there are changes in regulations affecting patient care reimbursement for hip and knee surgery. AAHKS develops strategies to keep up with changes and to influence the law-making process. Advocacy is necessary to maintain adequate compensation and reimbursement for services performed by hip and knee surgeons, as well as to ensure the quality of patient care. 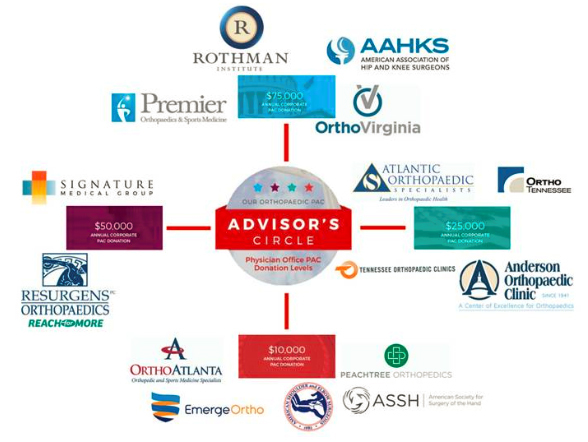 AAHKS sends letters and signs on to letters with other organizations, which are sent to legislators and key health care positions within the administration. Read the letters. The goal of this program is to provide Fellows with the requisite exposure, training, and skills to prepare for the advocacy of health policy efforts of AAHKS. Full Details. AAHKS has issued statements on positions held regarding removal of total knee arthroplasty from the CMS IPO list and the CDC’s guideline on the use of antibiotics for SSI. Read statements. AAHKS is a member of the American Association of Orthopaedic Surgeons Orthopaedic PAC (OrthoPAC) Advisor’s Circle, which allows us to work together to maximize our opportunities to make an impact in Washington, DC for the benefit of our members. You can help strengthen AAHKS’s advocacy voice by contributing to OrthoPAC from your smartphone. Text the word AAHKS to the number 41444, and follow the link that will be sent in the reply. For just $84 a month or $250 a quarter, you can become part of the Capitol Club Program. OrthoPAC encourages supporters to share this with colleagues. Or click the button below to log in and donate online.